ESP8266 might be the cheapest WiFi SoC for IoT application available, but it’s not really renowned for its power efficiency, and is often not considered the best choice for battery powered applications. This has not stopped Jeifa from developing a WiFi smartwatch based on the chip, and the 250 mAh battery used in the design is said to be good enough for 1 or 2 days of operation on a charge. He designed the PCB with Kicad, and the firmware is based on esp-open-sdk, with all hardware and software files released in github under respectively Creative Commons Attribution-NonCommercial-ShareAlike 4.0 International (CC-BY-NC-SA), and MIT licenses. Bear in mind that the project is mostly a hardware project, and the firmware is used to show the hardware works, so you may have to tweak the code to have the watch do what you want. Jeija also shot a video showing how to solder the components and test the watch as you build it. Interestingly enough, he could not buy ESP8266-EX chip directly, so instead he bought ESP-01 module, and unsoldered the chip to solder it back on the watch PCB. His other videos show how it can be used as a compass or game controller. This is awesome. I want it! 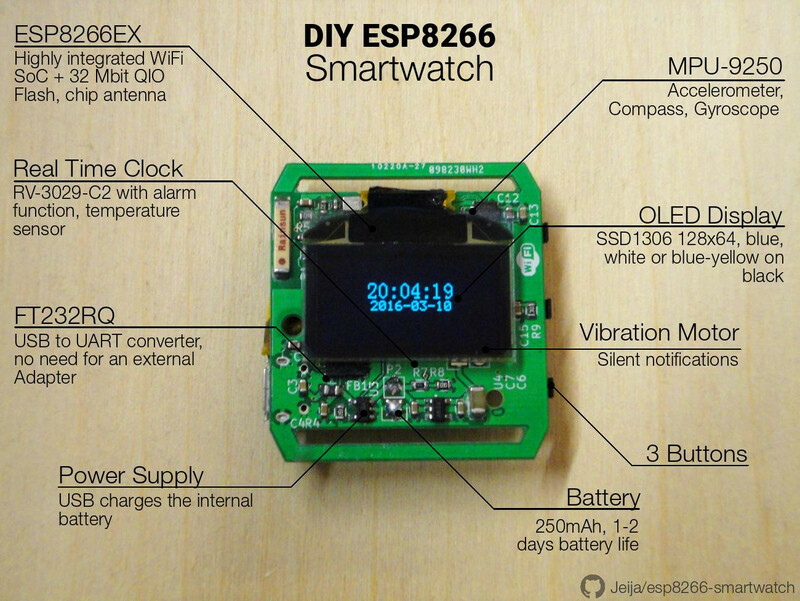 Also, with ESP32 and it’s BLE it’s gonna be true smartwatch. Is possible make with ESP8266 or ESP32 compact wristband touchpad with buttons to emulate mouse? Or even use compact wristband with Thinkpad TrackPoint? How well the ESP fit for the creation compact HID device? ESP32 has a capacitive touch interface so it should be feasible. ESP8266 would likely require a separate chip. Awesome project, perhaps no one thought about using esp8266 as smartwatch base before this.